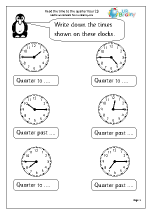 Time: how much time has passed? 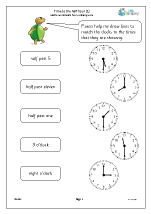 Revise telling the time to the half hour. 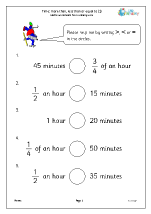 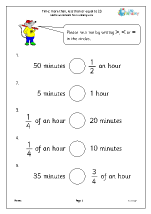 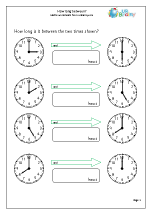 Revision of earlier work on reading analogue clock faces to the half hour. Using analogue clock faces to read the time to a quarter of an hour. 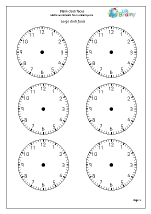 Using analogue clock faces, telling the time to five minutes. 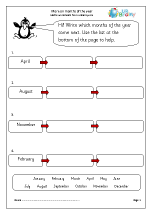 Putting times in order, days of the week, months of the year and other time problems. 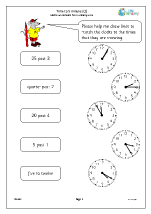 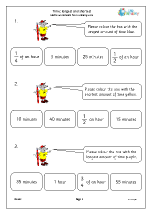 Children should enter Year 2 (age 6-7) familiar with an analogue clock face and being able to read the time using a clock face to the hour and to the half hour. 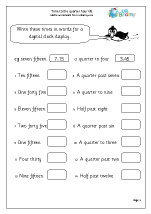 They should also be familiar with the order of the days of the week and the months of the year, although this will need to be revisited in Year 2. 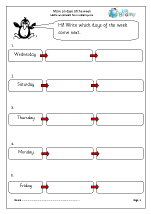 We have some great pages on both days of the week and months of the year for Year 2 children. 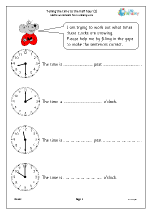 Work on the analogue clock face continues in Year 2, firstly with telling the time to the quarter hour and then reading the time to 5 minutes. 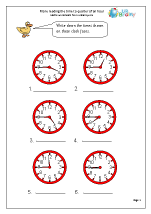 Again, a large clock face with hands is an invaluable resource. 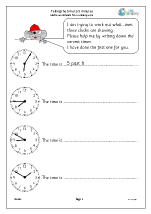 A good way to practise this is for children to draw the hands on a clock face to show these times and we have templates showing clock faces without hands which can be easily printed out. 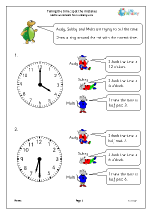 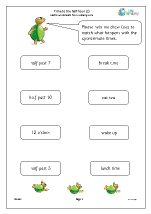 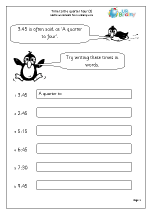 Children will need a good deal of practice reading the time to 5 minutes (e.g. 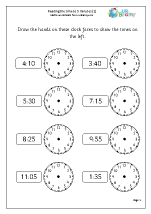 5 to nine, 10 past nine, 25 to ten etc.) 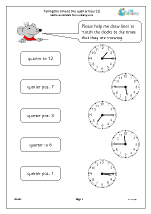 and learning about the complexities of to and from the hour. It is interesting to note that we don’t say 40 minutes past eight, but we do say eight forty or 20 to nine. 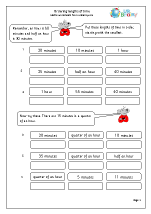 This will need the knowledge that an hour is made up of 60 minutes, a half hour is thirty minutes and a quarter of an hour is 15 minutes. 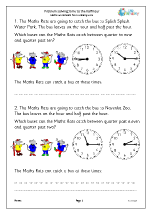 There may not seem quite as much to do in Year 2 on time as there is in other areas of maths, but it is important that children gain confidence. 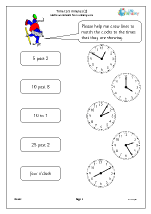 It is surprising how many struggle with analogue clocks, especially now that fewer children wear a watch, preferring to use digital displays on phones etc. 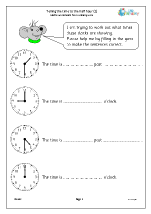 Reading a time on a digital clock comes later.